Early scholars from Arabia to Greece to Tibet regarded the circle as a perfect shape that embodied the divine and supernatural. The Okugawa-Akira seal envelopes the philatelic scholar's consciousness with a similar aura, the circumstances of its appearance on coconut stamps steeped in as much mythology as fact. The first name Akira puts it in the same celebrity club as a class of starship in Star Trek, two Indian movies—action and romantic—from 2016, a 1988 Japanese animated science-fiction film, and a 1982 manga series set in post-apocalyptic Tokyo. Yet for years philatelists had thought Okugawa's first name was Ryo, the character in the seal having alternative legitimate pronunciations. The correct name was established only in 1977 when researchers finally asked the man himself. 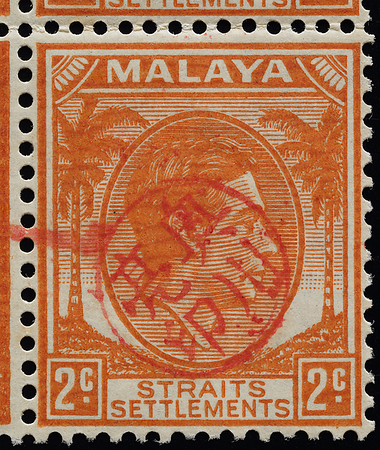 The overprinted stamps, which appeared in October 1942, are thought to be request stamps (Cheah 2001) sold at Penang's Zaimuka (Finance Section) but not at any post office (Harral 1961a). Postally used examples exist, and the stamps may have served as small change as well (Ricardo 1962, Coulter 1965, Dewey 1965b). A stamp dealer during the occupation regarded the overprint as 'philatelic nonsense created by a Japanese official and a Chinese post office employee' (Proud 2001), but Okugawa himself seemed to contradict empirical evidence by claiming in an interview (Tomioka 1977) that they had been for fiscal use. Cheah (2001) and Tsuchiya (2001b) list and describe all loose and on-cover specimens known to be in existence—no more than 54, or just half a sheet of stamps. The seal was made in Penang with an unspecified material from Bangkok (Tomioka 1977). I have seen well-overprinted examples with crisp and uniform rims very close to a perfect circle. The seal face could have been cut mechanically. It was not reported whether Okugawa had applied the seal himself. It seems that most applications of the seal, like the one shown above, are rotated anticlockwise from the vertical, suggesting that the applicator was right-handed. I have encountered one form of forgery of the seal, a few copies of which were recently offered online. The forgery, which I believe is the first to be reported, has crude characters with uniformly thin strokes that look as if they were drawn with a pen tool in computer software and printed. 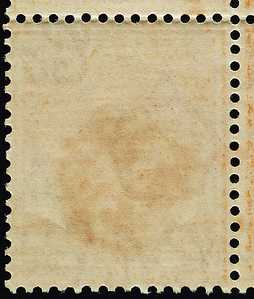 The oily ink used to overprint the stamp has percolated to the back of the thin striated paper. The seal has been meticulously described and catalogued, yet basic questions remain unanswered about the circumstances that led to its manufacture and use in the first place (Lin 2018b). For example, why was the less formal oval seal used initially for overprinting, instead of this circular seal? It could have been on the grounds of security, as the full-name seal was traditionally used in Japan for personal financial transactions rather than documents for mass circulation. Alternatively, the circular seal might have been manufactured after the initial overprinting, given that stamps overprinted with it appeared half a year after the oval seal, in October 1942. Was it made at the same shop as the two new copies of Okugawa's oval seal that were hurriedly ordered when the original wore out? It would seem surprising if Okugawa did not already own a formal circular seal from before the war, but he might have left it at home in Japan given its limited use as authentication in other countries. It also makes me wonder whether Okugawa’s subordinate, Uchibori Nobuharu, had a full-name seal as well. Okugawa's circular seal was in his possession as a war memento as late as 1977 (Tomioka 1977). It could still be around, hidden somewhere in the home of his descendants or in an antique shop.